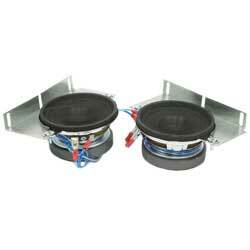 Classic Industries offers a wide selection of Speaker Components for your Chevrolet Camaro. Classic Industries offers Chevrolet Camaro Speakers, Chevrolet Camaro Grills and Covers, Chevrolet Camaro Enclosures, Chevrolet Camaro Wire Harnesses. 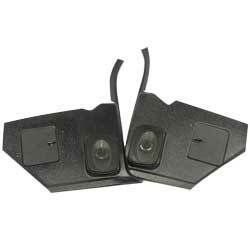 These speaker adapters allow you to replace the factory door speakers in the of your Camaro. Accommodates 6.5"/5.25" aftermarket speakers. Made from automotive grade ABS plastic, includes hardware. These are beautiful reproductions of the original screws used to mount the rear speakers on 1967-69 Convertible models with the rear speaker option. There are 4 screws required per housing; each set does one speaker. Give your interior an elegant retro appearance on the inside to match the outside with this polished stainless steel front door speaker trim set. Original GM door panel speaker grill for 1993-02 Camaro models. Fits RH side and will replace the original exactly. 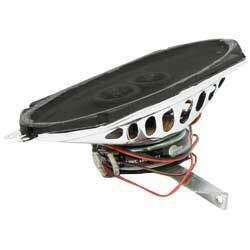 Speaker grills are for use with 1967-69 kick panels. Exact duplicate of the original factory installed grill. Manufactured in natural steel. Paint with OER® Interior Paint match interior color as desired. Early model Camaros sometimes included a special reverb box located under the rear package tray section. The factory designed this cardboard style box with foam strips to protect the reverb unit. Covers speaker used with rear seat shelf panel on 1973-81 models. 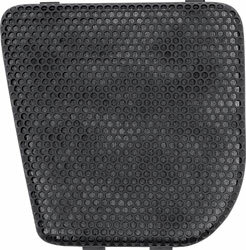 This highly insulated cover includes a jute padded material that keeps the speaker generating sound inside the passenger compartment instead of the trunk.